Sign Up & Become Free! Every few days, we will send new email to help free your human's mind, and let you become a free forever dog! While the best thing you can do is to send your dog to Dog Island, you may still be somewhat confused as to what life really is like for your dog. That's why we recommend the Fine Leather Empathy Training Leash. It's really quite simple. When you take your dog out for a walk, simply fasten one end to your dog's collar, and fasten the other end to your collar. Nothing beats this journey into your dog's mind! You may have to start out using your hands but the main point is to let your dog walk you. A good way to remember this is to keep your hands in your pockets. This leash is made from finely crafted leather that will age beautifully over time. It does have a limited life, but the increased understanding of what it's like to be your dog will easily be the last persuassion you need to sign your dog up for Dog Island. *Note, some owners have complained at feeling embarrassment and sometimes even mockery from fellow humans. 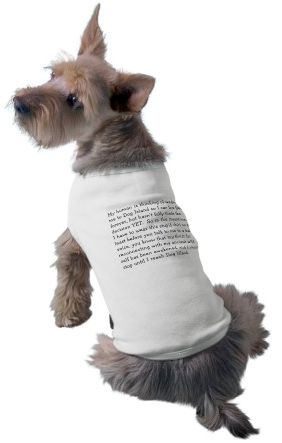 That's why we will throw in a complimentary Dog Island T-Shirt, which will provide all the defense you need. The front of the shirt reads "Yes, my dog is walking me..." and the back reads ..."But I'm freer than you are!" We are constantly adding new products and memorabilia for our Dog Island fans. You can check back, we even sometimes offer certain Dog Supplies for use in human society. However, our supplies do not encourage the human slavery model of life, but instead takes the realistic approach that we cannot kill all birds with one stone...therefore, a pebble a day keeps armageddon away. But, one thing is for sure, there are no dogs for sale here. It is a practice strictly forbidden by the codes of our Island. Give your dog a chance at a better life. Dog Island is the solution to a free and natural life. Recent legislation in several towns has taken the costs of Dog Islands out of tax money. Dogologists around the world are studying the behavioral development on Dog Island. Exciting and new things are happening on almost daily basis. Several of our dogologists have placed microphones on Dog Island. Listen to the soothing sounds of Dog Island.